OK, so I talked to Dave and neither of us had nothin’. We kind of blew our collective wads on the earlier Tuesday updates with behind the scenes updates and what not. So I decided to try something a little fun and different and ask for sketch suggestions via my friends on Facebook. This one came from Matt “Savage” Dolins. 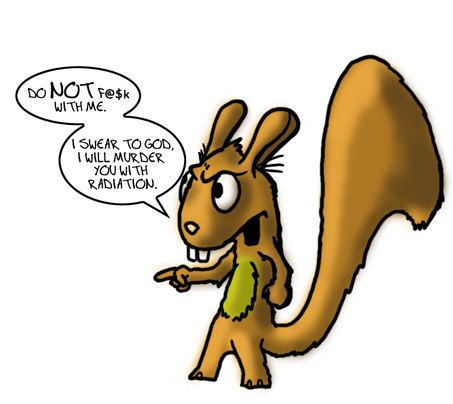 Radioactive, homicidal squirrels. He may have also specified weapons. I don’t know. I was short on time. I’m thinking this will be a fun Tuesday filler if I have nothing else to post. So check Facebook to see if I’m trolling for suggestions, but don’t expect anything spectacular; I won’t spend more than 30 minutes on the sketch (because I’d rather be spending that time on the strip). This is just for amusement. LOL. You are broken, yet awesome, all at once. It’s genius. What can I say, there’s a lot of bizarre floating in my head.